Beer Nerd Details: 6.3% ABV on tap. Drank out of a pint glass on 6/23/11. Sierra Nevada Beer Camp #48: Hop Smack - This one has a less clear provenance. It's not even listed on the Beer Camp site, nor does it appear on Beer Advocate. I did find the RateBeer page, but it only has one review! Basically, it's one of them American Black Ales (or whatever the hell you call them)... actually, it said it was a Double American Black Ale. My experience with the style is limited, but since ExPortation was so awesome, and since I was unlikely to ever even see this again, I gave it a shot. 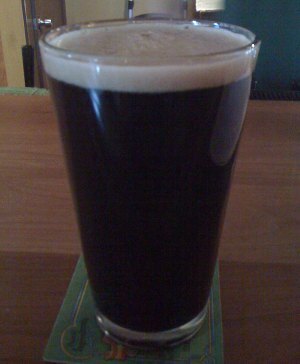 It pours a very dark brown, almost black color with a finger of head. Smells surprisingly hoppy - almost no roastiness getting through to the nose. The taste is almost wholly like a DIPA. Sweet, hoppy, and bitter. 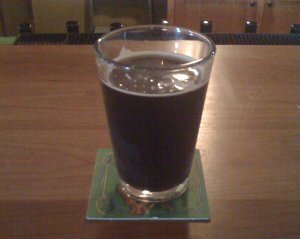 At first, no roastiness at all was apparent - if you blindfolded me and made me taste, I probably would not have guessed that it was an American black ale. As it warmed up and I got to the bottom of the glass, I got the faintest hint of roastiness out of the beer, but it wasn't much. Now, don't get me wrong, it's not a terrible beer or anything, it just doesn't seem like a particularly good take on the style. That, or my palate was obliterated by the likes of Pliny and ExPortation (both very strongly flavored beers). I'll give it a B-, as I was disappointed, but I suppose others might find more to like. Beer Nerd Details: 8.1% ABV on tap. 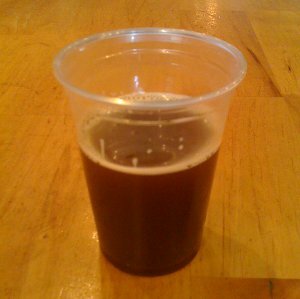 Drank out of a half-pint glass on 6/23/11. 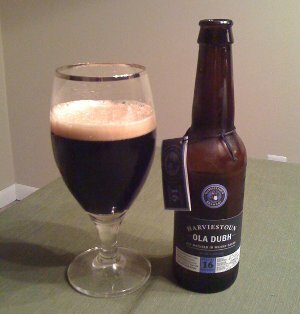 A while ago, in a post about Scottish Wee Heavy beer, friend and fellow beer nerd Padraic recommended another Scottish beer called Ola Dubh. The name translates literally as "Black Oil", presumably a reference to the color and goopy consistency of the porter-like beer. This is a series of beers based on the recipe for brewer Harviestoun's more traditional offering, Old Engine Oil, an English Porter. They take a higher gravity version of that beer, then age it in used Highland Park oak casks. This is apparently pretty notable, as most barrel-aged beers aren't aged in traceable casks from a named distillery like this. Their website says it's the first barrel-aged beer with "genuine provenance". This is probably pure marketing fluff, but hell, I'm a sucker for that kind of thing. As of right now, there appear to be 5 different varieties, based on the age of the scotch casks (not based on the age of the beer itself, which we originally thought). On a recent visit to beer Mecca State Line Liquors, I picked up a couple of bottles, and this past Monday, I cracked them open whilst taking in a double feature of How To Train Your Dragon and Scott Pilgrim Vs. The World. I'd seen both movies before, but they seemed better this time around. I have to wonder how rewatchability can and should color my reaction to movies. It's a subject I've mused on before, but as I drink these beers, I'm now wondering how redrinkability should color my reaction to a beer. Most of the reviews on this blog are based on a single tasting, but a really full appreciation should probably require multiple tastings. As such, I'd really like to revisit the below brews. As hard as that's likely to be on my wallet (these are not cheap beers), it would probably be worth it in this case. Beer Nerd Details: 8% ABV bottled (11.2 oz). Drank out of a goblet on 6/20/11. Bottled July 2009, bottle number 37471. 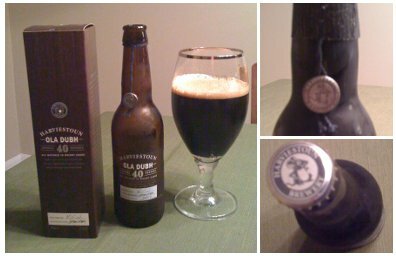 Harviestoun Ola Dubh Special Reserve 40 - Pours a little thicker, but with that same opaque black color. The head is a bit darker this time. Smell features a bit more of the Scotch this time around, maybe even a little peat smoke, but that chocolate aroma is still clearly there. Again, smells fantastic - a little more complex this time, but certainly along similar lines. Taste has a similar profile, but the flavors are much richer here. The Scotch flavors mix with the roasty chocolate in a more balanced way, and it's just as compulsively drinkable as the 16. Fuller bodied, even. This is an amazing beer. Rich and complex, powerful and subtle, all at the same time. Rating this is weird. I have a pathological inability to give out the highest rating possible (I've only given it once, and that's partially because that beer also has sentimental value and partially because I've had it so many times), but I've only had this once (right now!) Yeah, it's rocking my world, but will it always do so. I'll give it a provisional A+. It's perfect, but given my above musings about redrinkability and the fact that I'm a sucker for the marketing fluff behind this, I'd like to try this again! Beer Nerd Details: 8% ABV bottled (11.2 oz). Drank out of a goblet on 6/20/11. Bottled January 2009, bottle number 54570. Whisky casks are from 1968! Well then, I now want to pick up the 12, 18, and 30 varieties of this beer. I'd also like to try and compare the 40 vs some other sort of barrel aged imperial stout. As mentioned before, these are quite expensive. The 40 was $20 for a single bottle, which is astronomical, but for me, it was worth it (and there've definitely been times when spending a lot on a single beer has disappointed me, despite the beer being really good - i.e. Allagash). Russian River Pliny the Elder - Named after the famed "Roman naturalist, scholar, historian, traveler, officer, and writer", Pliny the Elder was one of the folks responsible for initially classifying and documenting hops. The beer itself is somewhat legendary. It's been at or near the top of Beer Advocate's Top 100 Beers on Planet Earth list for a while now (last year it was at #1, right now it's at #3). It's also somewhat rare, which may be part of why it's always ranked so high - a hard to find beer always tastes better once you find it! I've been keeping my eye out for some for a while now, and have had a couple of near misses before this, so when I actually got myself a glass tonight, I was quite pleased. 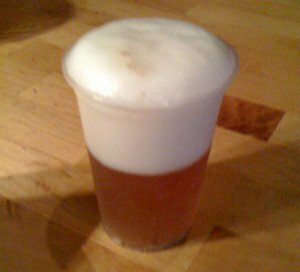 Pours a dark golden orange color, mostly clear, with a finger of perfect white head. Aroma is extremely hoppy and quite complex. Full of citrus and some pine, with a nice boozy, malty sweetness in the nose. I could hardly wait for the head to subside, so my first sip got some of that double IPA feel, but with a creamy head texture - a very good first impression. The taste starts off nice and sweet, with some citrus and pine, then you get hit with a wave of bitterness that intensifies as you approach the finish. Sometimes I feel like a lot of DIPAs overcompensate with massive amounts of malt, actually leading to less bitterness (despite the higher amount of hops/IBUs,etc...), but not Pliny. This isn't to say that it's overwhelmingly bitter or anything - it's actually just perfectly balanced. Every component sings. Mouthfeel is also extremely smooth (I'd say "velvety" if I knew what velvet tasted like) and it goes down incredibly easy. I could drink these all night, which usually isn't the case for beers this big. Beer Nerd Details: 8% ABV on tap. Drank out of a, what would you call that, a goblet? 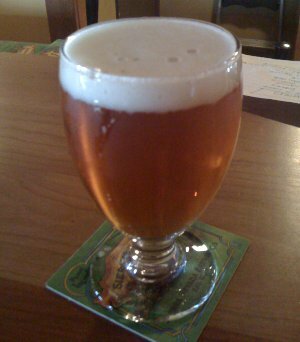 Now, of course, my focus shifts to finding me some of Pliny the Elder's rarer sibling, Pliny the Younger. I expect that to be a much more difficult task - apparently only a handful of kegs make their way to the East Coast every year. I'm not complaining - most areas are not fortunate enough to get any of that beer, and Philly seems to always get at least some (even if you have to wait in line for hours just to get a few ounces). * Ok, so I was actually told ahead of time that the bar had Pliny on tap, but still. I've been told this before and still missed out on some Pliny goodness (this stuff don't last long). Thanks to friend and fellow beer lover Mike for the tipoff! So, you know single malt Scotch? Yeah, single hop IPAs are nothing like that. What they are, though, is a really fascinating look at one of the key ingredients in beer: hops. The concept is simple. A brewery comes up with a solid IPA recipe, but instead of a mixture of different hops, they use one single hop variety. 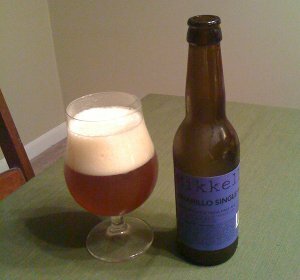 In this case, Mikkeller brewed a series of 12 beers, each with the same recipe... except for the hops, which change with each beer. There are typically 3 additions of hops during the brewing process. First comes bittering hops - these are added at the beginning of the process. Boiling these hops for about 60 minutes will release the alpha acids contained in hops, which results in the bitterness in beer. Alas, such a long time boiling also destroys most flavor and aroma from the hops, hence the next 2 additions: Next are taste hops, which are typically added about 45 minutes into the boil and impart a completely different character to the beer's taste (the 15 minutes of boiling time is not long enough to release alpha acids, but it's just right for imparting various fruity, floral, etc... flavors to the beer). Finally, there are aroma hops, which are added near the end of the boil (typically around 5-2 minutes remaining) and impart the proper hoppy smells. There are, of course, lots of other ways to do it (continuously hopped beers, beers with an additional dry hopping step, styles that only take one or two hop additions, and so on), but the above is the most common process. Hops are fantastically variable when it comes to bitterness, taste, and aroma, so for hoppy styles like an IPA, brewers will combine those various characteristics to create something unique. Some hops have lots of alpha acids and are thus great for bittering, but they're also lacking strong flavors or aromas. Some hops have great flavor and aroma, but low alpha acids. Some hops are ideal for only one piece of the puzzle. Other hops can be used for everything. If you're brewing an IPA, you might grab that high alpha acid hop for bitterness, but use a different hop for flavor/aroma (since those hops aren't boiling long enough, the alpha acids - whether high or low - don't matter much). And so on. The neat thing about a single hop beer is that you can get a really good idea what characteristics that hop imparts on a beer, and thus you can start picking them out in other beers. Of course, I'm only having 3 varieties tonight, and 2 of them ended up being somewhat similar, but still, it's a fun exercise (and these 3 were all great). Beer Nerd Details: 6.9% ABV bottled (11.2 oz). Drank from a tulip glass on 6/18/11. Bottle cap had "23/12/11" on it - perhaps a drink by date? Beer Nerd Details: 6.9% ABV bottled (11.2 oz). Drank from a tulip glass on 6/18/11. Bottle cap had "04/11/11" on it - again, perhaps a drink by date? Like a lot of Mikkeller beers, these are sometimes outrageously overpriced (I got mine for around $6 each, which is pricey, but a lot less than $10-$12 each, which I've heard people complain about), but lucky for you, Mikkeller isn't the only one playing with single hops. Heck, even Sam Adams released a case of their Latitude IPA with 5 single hop beers (and the original Latitude, which uses a combination of all 5). Unfortunately, Sam has never been particularly well known for their IPAs... but then, I've not had any of those, so I shouldn't talk. I do think it would be an interesting experience to try them though, and from the above, it does seem instructive. It's summer! On a recent beer run, I stocked up on various wheat beers and whatnot, and when I saw this particular beer, I was intrigued. Most wheat beers tend to be relatively light, crisp and refreshing. As such, they tend to be somewhat low in alcohol and a little thin in terms of body (but, you know, in a good way). 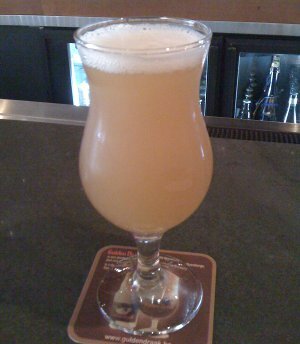 So the concept of a souped-up Belgian-style wit beer sounded intriguing to me. 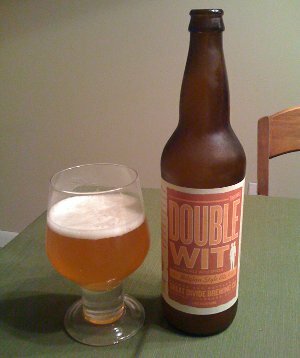 Great Divide Double Wit - Pours a cloudy gold color with a finger of bubbly white head. Aroma is fruity and spicy. It's definitely a unique aroma, not like anything I can think of, though there similarities. The taste starts off very sweet and bready, with some spiciness thrown in there (apparently coriander and orange peel). There's some fruitiness apparent as well, but I can't quite pick out the specific flavors. The finish is just a bit sticky with booze - the alcohol is noticeable and makes for something of a weird aftertaste. The body is strange. It seems to start out full bodied, but then it thins considerably by the finish. This is something I associate with wheat beers, but it's not usually this prominent (no doubt a result of the high alcohol) and it doesn't entirely work. I can't quite decide how much I like it. It's certainly an interesting brew, but it's poorly balanced and definitely not one of my favorites. I'll give it a B-. Beer Nerd Details: 8.1% ABV bottled (22 oz bomber). Drank out of a tulip glass on 6/10/11. Strangely, Great Divide has nothing about this beer on their website. Also, I have no idea why there is a two headed... monster? Kid? on the label (presumably a play on the "double" nature of the beer, but still), and yet, I rather like it and want to watch a movie documenting its rampaging exploits. Unfortunately, you can't drink labels. Dupont Bière De Miel Biologique - Apparently one of Dupont's series of "organic" beers (seriously, though, what the hell does "organic" mean in this context? Perhaps another rant for another time...), the name of this beer translates to "beer with honey" and represents a reproduction of a very old recipe. Indeed, they claim the label is an almost exact reproduction of the original label from 75 years ago. Beer Nerd Details: 8% ABV bottled (750 ml, caged and corked). Drank out of a goblet on 5/28/11. I have to admire Ommegang's ability to incorporate brewery-name puns into their beers. It's inspiring. 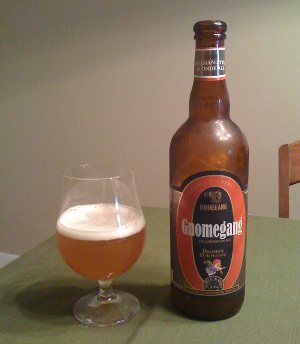 Ommegeddon, O'mmegang (an Irish stout that I've never had), Obamagang (aka Inauguration ale) and now Gnomegang, a collaboration with sister brewery, Achouffe (world renowned for the cute little gnomes that adorn their bottles... and, you know, I guess they're known for their good beer too). Both breweries are owned by parent company, Duvel, so it's not much of a stretch to see these two collaborating, but it's still nice. 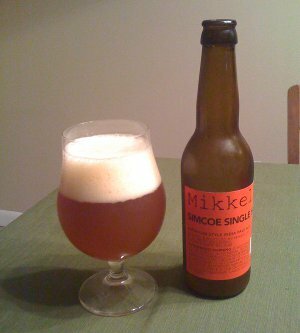 Beer Nerd Details: 9.5% ABV bottled (750 ml, caged and corked). Drank out of a tulip glass on 6/3/11. Philly Beer Week kicked off last week, but since I'm one of those suburban types, I'm not sure how often I'll be able to make it into the city for the festivities. Lucky for me, there are quite a few events happening out here in the burbs, so who knows, I may end up filling my schedule with good beer this week. First up was an event on Saturday that featured Stillwater Artisanal Ales, 12% Importers (who happen to work with Stillwater quite a bit for reasons I'll get into in a bit), and the Shelton Brothers Importers (who import a crapton of foreign beers, including the likes of Cantillon, Mikkeller, Fantôme and more). 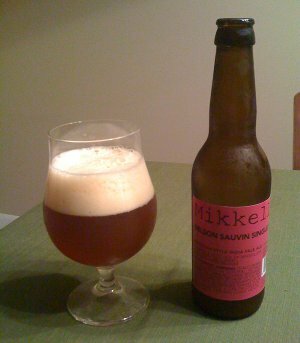 The focus of the event was Stillwater, which is another "virtual brewery" (or "gypsy brewer") like Mikkeller. Brewer Brian Strumke doesn't have a brewery of his own - he basically schedules time with breweries that have excess capacity and then brews his beers there. It turns out that the majority of his brewing is done at the DOG brewery in Maryland, and he says that once they got up and running, he doesn't need to be as involved in the day to day brewing activities. He also makes trips over to Belgium and does some limited edition stuff there that is then imported (by the aforementioned 12% importers). I didn't get a chance to speak with him that much, but I did ask him why he seemed to primarily brew saisons and how he liked to differentiate his brews from others that specialize in the style. He seems to enjoy the variety that saisons afford, and he also mentioned that he tends to prefer dry beers, as they go much better with food. I get the impression that he really likes working with saison yeast strains as well, as there were a couple beers featured that were not typical saison styles, but which apparently used saison yeast (more on this below). I actually mentioned that I was planning a saison homebrew and was thinking of using the Wyeast 3711 French Saison yeast instead of the 3724 Belgian Saison yeast, and he mentioned that a bunch of his brews used the French Saison yeast and that if I was worried about temperature control (which I am! ), that was the way to go. He talked a bit about the first time he used the Belgian Saison yeast and how hot it got during fermentation (upwards of 90 degrees), but he also has access to equipment that is slightly more advanced than my crappy plastic bucket. I felt kinda dorky asking him about homebrew and I hope I wasn't being too bothersome, but he seemed to perk up when I asked him about it (I guess it's better or at least different than the typical questions he gets, which I imagine revolve around his "gypsy" brewing lifestyle). He gave me two pieces of advice when it comes to extract homebrewing (we were talking about saisons and dark Belgian styles): 1. Use the lightest malt extract available and 2. Try to do mini-mash as soon as you're comfortable with it, because you're otherwise totally at the mercy of the folks producing the extract (and there's apparently not much consistency or control over that part of the process). He mentioned how in his early homebrewing days he tried using one of those pots with a built in spaghetti strainer to do a mini-mash (with what I gathered were mixed results, but it was a fun story). I don't know that I'm quite ready for mini-mash just yet, but it's something to keep in mind. Beer Nerd Details: 6.6% ABV on tap. Drank out of a tulip glass. Beer Nerd Details: 7.2% ABV on tap. Drank out of a plastic cup. Beer Nerd Details: 10% ABV on tap. Drank out of a plastic cup. Beer Nerd Details: 7.5% ABV bottled (I didn't drink the whole bottle, it was shared!). Drank out of a plastic cup. Beer Nerd Details: 8% ABV bottled (I didn't drink the whole bottle, it was shared!). Drank out of a plastic cup. 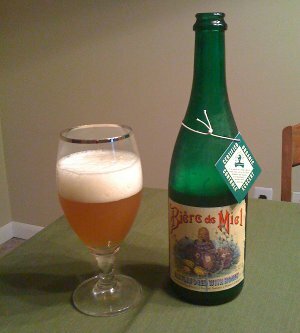 When I was talking to the 12% guy, I noted that the Hof Ten Dormaal and other famous saisons (like the aformentioned Dupont and Fantôme) are all packaged in green bottles, which don't protect at all from light (which can create off flavors and "skunking"). I asked him if he knew why and he said he wasn't really sure, but it seemed like a traditional thing. I think I will be sending some more pedantic emails to breweries in the near future! I've decided not to focus on the substance of beer, but the material that plays a supporting role. Bottles, coasters, cans, labels, ads, tap handles, church keys, hats, t-shirts, tip trays, glassware and signs have been collected by fanatics ever since beer has been sold. These objects constitute the world of breweriana, a term that surfaced in 1972 to define any item displaying a brewery or brand name. The majority of highly prized objects are from the pre-prohibition era, but ephemera from every period in brewing history, including craft beer, finds a home with each beer drinking generation. So what old or new beer related items do you collect and why? It's that simple. I suppose the only thing that I have a pretty wide variety of is beer bottle corks. I didn't really consciously think to myself: Self, I should collect beer bottle corks! but I do tend to have some packrat tendencies and have recently found a couple of caches of corks (click for larger version). Indeed, I am often intrigued by what appears on the cork. Some have nice artwork or patterns, some use it as a way to date the beer, some show the preferred glassware, some just have the brewery name printed on there, and some are just plain and unadorned. They're not as varied or interesting as, say, Bottle Caps (come to think of it, I probably have a lot of those lying around as well), but I like them. Obviously I don't keep every cork, especially since each brewery seems to use the same corks for most bottles, but I will keep ones I like or find interesting. So, yeah, not a very exciting collection, but then, I prefer to direct my energy to finding and drinking beer. Speaking of which, it's Philly Beer Week! I should be drinking (Maybe I'll save a cork or two).